So, after a typically tumultuous night of Scottish Premiership action, it's the Hibs fans who head home happy. They're into the top six on goal difference - albeit that could change before the weekend's out - and new boss Paul Heckingbottom has won both games in charge, playing some very tasty football in the process. 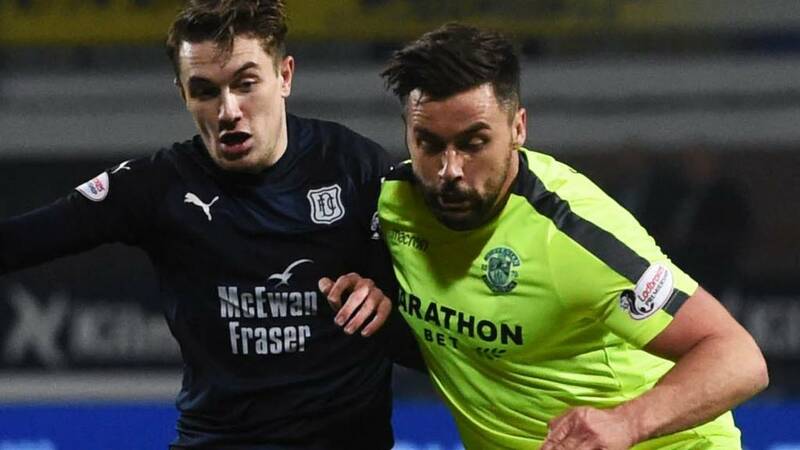 Dundee remain level on points with second-bottom Hamilton Academical and five clear of St Mirren. They were very good in spells, but some ropey defending cost them dear. Certainly, Jim McIntyre has transformed the meek and feeble side he inherited earlier in the season. The highlights will be up online in a couple of hours, and we'll have more top-flight commentary tomorrow and on Sunday. Join us again for that, and thanks for your company tonight. Jim McIntyre, then, not too happy about being denied an early penalty after Mark Milligan appeared to grapple Ryan McGowan to the deck. The Australian was also caught by the boot of Marc McNulty having just fouled the Hibs striker - replays suggested McNulty was trying to, as they say, "leave one on" his opponent and it will be interesting to see if any disciplinary actions follow. Kenny Miller's two disallowed goals were both very close calls - he was just offside for the second one, but the first was harder to tell. And Scott Wright might be in trouble too - his knee connected with the head of the prone Milligan after he'd dispossessed the Hibs midfielder. Dundee boss JIm McIntyre on BBC Radio Scotland: "I thought it was an entertaining game, we defended poorly, especially for the goals, and that gave the impetus to Hibs. "A couple of key decisions didn't go our way. It's a stonewall penalty on Ryan McGowan. It's also a red card when McGowan brings down McNulty and he gives him a wee dig in the face with the bottom of his boot. "But ultimately, if we defend, we had some really poor individual errors and it's hard to recover from that. "But there was a lot to be pleased about. The way we kept going, we're a different side from the one I inherited in terms of that spirit and never-say-die attitude and the quality as well. "For the second Hibs goal, we're totally sleeping, Genseric Kusunga should stay with his man, space doesn't score, it's as simple as that. If you choose to leave your man, you've got to cut the ball out. That was disappointing and something I've made crystal clear, the way I want our defenders to defend. "The first goal, again, is a bad decision - just defend it, don't try and show you're stronger than the other guy, get a boot on it and clear your lines." Hibernian head coach Paul Heckingbottom on BBC Radio Scotland: "The win is the most important thing. Dundee have really hit a bit of form and been hard to play against. "The message is we want to be positive and want to score goals. It actually made the game harder for us second-half, but I have to accept that consequence of the message - go and be positive, go and be brave. But really, there were opportunities at 4-1 where we didn't have to always try, we could have kept the ball and took the sting out the game. "I'll continue doing that because it's important to have that sort of bravery for the longer term. "Whenever they put that effort in and give performances like that, I have to accept mistakes because I'm probably pushing them further than they're capable of, making them uncomfortable, but that's what it takes. "So I'll stick up for them and their mistakes when they put in a shift like that." Quote Message: When Stevie Mallan signed for Hibs in the summer, he hit the ground running and hasn't really stopped. He had a little dip over four or five weeks as a lot of the Hibs players did. He's in the inside-left position for the third goal, he's come all the way across on a diagonal run. And the fourth, I don't think there's another player on the pitch would have attempted to hit that one. But his first thought is, it's out of my feet, I'm having a go, and he's got such terrific technical ability. When Stevie Mallan signed for Hibs in the summer, he hit the ground running and hasn't really stopped. He had a little dip over four or five weeks as a lot of the Hibs players did. He's in the inside-left position for the third goal, he's come all the way across on a diagonal run. And the fourth, I don't think there's another player on the pitch would have attempted to hit that one. But his first thought is, it's out of my feet, I'm having a go, and he's got such terrific technical ability. Hibernian goalscorer Stevie Mallan on BBC Radio Scotland: "That's the position the manager wants me to pick up, in those little pockets where I can turn and have a strike. The third goal was a better opportunity for me to score but I'm glad we've got a striker like Marc McNulty to get in about the box and score. "I feel fit, I feel I'm playing well, the team's on a high, you're going to have that little kick on when a new manager comes in. "Top six is the main priority. We're here now and now it's whether we're capable of staying here. We know we can. Going away to St Johnstone on Wednesday is one of the hardest places to go in the league. If we keep what we're doing, we can go there and get a win. "The goals are coming back from open play - that was a big thing I felt we needed - and we're getting more stability at the back." Quote Message: It was a very cagey opening 20 minutes then it was very open. The second Hibs goal was pivotal. Dundee got that sensational Paul McGowan equaliser then they just switched off for a throw-in. Dundee then had to open up, chase the game, and allowed space to open up. It was a very cagey opening 20 minutes then it was very open. The second Hibs goal was pivotal. Dundee got that sensational Paul McGowan equaliser then they just switched off for a throw-in. Dundee then had to open up, chase the game, and allowed space to open up. Quote Message: I did anticipate goals. Both these managers like to attack. Hibs were ruthless. The way they went about their goals was brilliant. Dundee will be reeling because every one of those goals had mistakes in them from their part. But Dundee kept going, which bodes well for the future. I did anticipate goals. Both these managers like to attack. Hibs were ruthless. The way they went about their goals was brilliant. Dundee will be reeling because every one of those goals had mistakes in them from their part. But Dundee kept going, which bodes well for the future. A fine, fine win for Paul Heckingbottom's Hibs. They're into the Premiership's top six - for tonight at least - and the new gaffer has two wins out of two. Breakaway goals from Florian Kamberi and Marc McNulty gave them a 2-1 lead at the break, either side of Paul McGowan's delightful finish for the home side. Stevie Mallan's shot was parried into the path of McNulty after the break, who bundled Hibs into a two-goal lead, before Mallan rasped home a howitzer than Seny Dieng might reckon he should have saved. Kenny Miller had two goals disallowed for offside as Dundee sought a way back, with Martin Woods' well-worked effort all they could muster. Oh, was that a deliberate knee from Scott Wright to the head of Mark Milligan? Wright does really well to dispossess Milligan and win a throw-in. With the Australian down after the tackle, Wright catches him with a knee as he runs past. With Dundee piling forward, Hibs almost finish the game on the break. Flo Kamberi, who got away with a raised boot earlier in the move, scampers clear up the left but opts to go it alone instead of squaring for Oli Shaw. It's well blocked by Ralph and out for a corner. Dundee win the ball back and try to launch a late raid, but it comes to nothing. Well, Milligan gets away with one but Omeonga certainly does not for a crude tackle on Scott Wright. Quote Message: That was a pretty obvious yellow card. John Beaton let Milligan off. That was a pretty obvious yellow card. John Beaton let Milligan off. Mark Milligan is incredibly fortunate to avoid a late yellow card for chopping down Jesse Curran. Dundee are penning Hibs in their own box. The visitors are sitting deep but they can't get out. The fans are urging Dundee forward - they still believe there's a point in this for them. Dundee can set up a grandstand finale with a goal in the next couple of minutes. They come pretty close here as Scott Wright races into the box between Paul Hanlon and Darren McGregor. He's got his back to goal and can't quite wrangle the ball under control. It trickles through to Ofir Marciano. Quote Message: A fantastic footballing goal. The ability, the quality to score that type of goal. Dundee haven't let their heads go down. Jim McIntyre will take a lot of comfort from that. A fantastic footballing goal. The ability, the quality to score that type of goal. Dundee haven't let their heads go down. Jim McIntyre will take a lot of comfort from that.